A household relocation involves a lot of important decisions, and whether you can afford professional moving services or not is just one of them. It’s never too early to start the moving preparations, so give yourself at least a couple of weeks to calculate your budget and establish which type of moving services you can afford. Also, take into account other factors that may help you make a good choice – time, distance and complexity of the move. Full-service NYC moving companies are designed to make your relocation process much easier. Professional movers know how to customize a moving plan according to your specific needs and requirements. Once you decide to go for a full service moving company you can rest assured that they will have everything covered and handle each aspect of the move in a professional and efficient manner. On the other hand, a self-service move involves a limited service provided by the moving company. While you are responsible for packing, loading, unloading unpacking, the moving company’s representative will only drive the vehicle to the new destination. A self-service moving is considered as a cheaper relocation option, but not necessarily. If you don’t have enough time to organize everything accurately or a lot of helpers to assist you, then a self-service option is not the most convenient solution for you. Sometimes a cost of a full-service slightly differs from other moving options and eventually you realize that an impeccable and comprehensive full-service is worth the price. If you are unsure as to which kind of moving service is right for you, you will need to compare your options considering all important aspects like expenses, distance, time, effort. Also, properly trained and experienced NYC movers can provide an efficient assistance when it comes to handling large, heavy and oddly-shaped items. 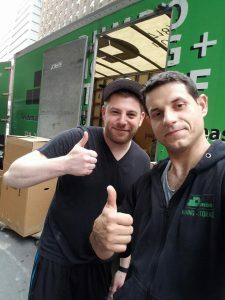 There are a lot of benefits of hiring full-service movers when relocating and we are here to make sure you are familiar with some of the most common services included in the full-service package. Full-service movers create a unique and customized plan according to your needs and requirements. Knowing that a reliable moving company is handling all tedious tasks will give a peace of mind and enough time to tackle other moving-related activities. After all, entrusting the whole process to a reputable full-service moving company leaves you enough time to de-stress and relax and prepare for what’s next. Remember that settling into you new home takes a lot of time and effort, so save your energy for the post-move tasks. – Full-service movers bring their expertise as well as packing supplies and necessary equipment, so that you don’t have to worry about a thing. They will drive the moving truck to your new residence. – You can be confident that your items will be packed and unpacked with the utmost care, which is especially important if you have a lot of breakable and valuable items like antiques, paintings, figurines and other fragile possessions. – They will take care of heavy and oddly-shaped items and ensure they are transported safely and accurately. Also, they will disassemble large items and reassemble them at the new location. – Loading and unloading moving boxes can be dangerous if not performed properly. Luckily, full-service movers will keep you safe from potential injuries caused by heavy lifting on moving day. – Reputable movers offer different types of moving insurance suitable for your needs. If you don’t mind letting someone else take control of the entire moving process, hiring full-service movers is highly recommended since it will make the whole process much easier and even enjoyable.